SMPS or switched mode power supply is an electronics device that is used to convert AC to DC, AC to AC, DC to DC and DC to AC voltages. The circuit consists of transformer, rectifier, voltage regulator and a filter. The input supply is turned On and Off by MOSFETs and outputs a high efficiency, regulated voltage. The SMPS used in computers is of AC to DC type supply. Power-IN. The power-IN connector as shown in the figure is the input for MAINS supply. A power cable is inserted here, the other end of which is connected to mains supply. The input supply gets converted to DC supply. Power-OUT. The power-OUT connector is connected directly to the Power-IN connector from inside the supply unit. It supplies the same AC supply that is fed to power-IN socket. 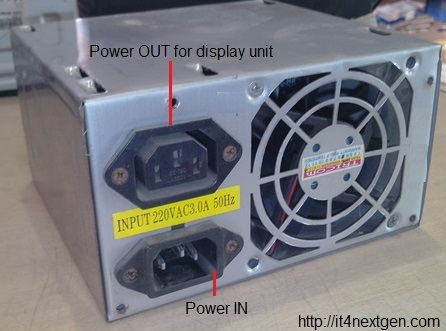 The power-OUT connector is used to give supply to monitors or any display unit. FAN. If you look at the back side of Computer-SMPS, you will find a FAN at the right side. The FAN as you can see, blows the air out and is only used to dissipate the internal heat from the SMPS since the switching is done at high frequencies which create a lot of heat inside. ATX connector. As you can see in the image, it is a 24-pin female connector which is used to supply DC supply to the motherboards. Various color-coded wires connect to this connector and each colored wire supplies distinct DC voltage which is explained in the chart below. ATX-12V connector. Latest SMPS power supplies are accompanied by an extra 4-pin connector which supplies 12 volts to energize the central processing unit and other components of the motherboard. AT Connectors. Earlier motherboards used to support AT connectors( 6-pin each) also called P8 and P9 connectors to supply power to these motherboards(upto 486 boards). 4-PIN connectors. There are multiple 4-pin connectors that draw out from the SPMS unit. These connectors are used to supply DC power to various peripherals of computer like a floppy disk drive, hard disk drive or DVD-writers. SATA-output connector. 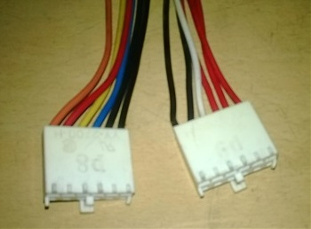 To feed the power to latest SATA hard drives, these connectors are used. To check the supply, whether it is working properly or not, you can test it before fitting it in the cabinet. There is a simple way to test the SMPS, you just have to short the green wired connector to any black colored(ground) connector. If the SMPS is working perfectly, the fan of the supply will start working. Thank u so much for valuable information…. Great article for SMPS . But there is no information about ampere that is carried by different colours wire which is very essential. If the SMPS is OK, it will turn on and you can visually check that it’s FAN is in also in running mode. Thank you for the information. It is help full SMPS problem rectifying.